More hunky farmguy? Here and here. More Donkey Doodle Dandy? Here. 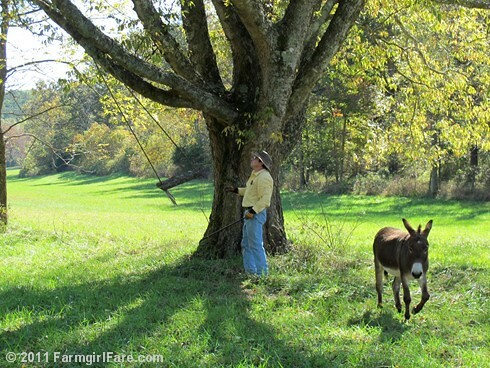 Was donkey wanting a turn on the swing or treats? LOL that is hilarious... was the donkey yelling that it was his/her turn??? (sorry not sure who that is!) Did your husband randomly find that swing?? I love this series of photos, cute beyond words! This made me laugh out loud! Thanks for the smile. What great pictures! Donkey Doodle Dandy looks to be "talking" to him in that last shot! How darned cute to see Joe enjoying the swing! I was thinking, how sweet of him to hang the swing for Susan. Big old huge smile on my face to see him hop up into it. Thanks for the smiles always, Susan. Off to try your pizza dough recipe for the first time. Wish me luck! Of course! ;) That's Donkey Doodle Dandy, our original donkey. If you look under the last photo above you'll find a link to more photos of him if you'd like to get to know him better. As for the swing, Joe made it about 18 years ago for some kids who were coming to visit. 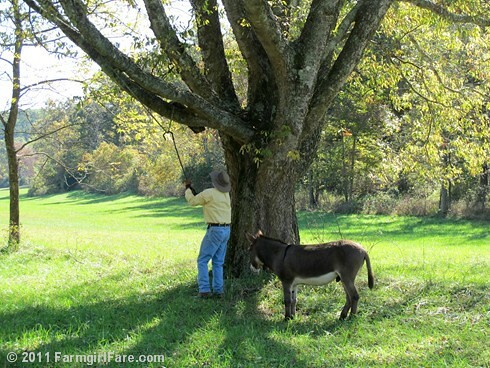 He'd had it tucked up in the tree so he wouldn't hit it with the tractor when he was cutting hay last month. There's a link to more swing photos throughout the seasons above, too. What was funny is that it's been so long since either of us had a good swing, we didn't realize that the tree had grown up so much, it's almost too high to get up on now, lol. I got such a kick out of seeing him up on that swing, especially since it's so high now his legs were really off the ground. I hope you had delicious success with my easy pizza dough recipe! That last photo looks like the donkey is laughing at him.